“The Sixth Sense” has debuted through powerful reversal. It’s 3-step transformation of Micky Park Yoochun. Lee Gak in SBS drama “Rooftop Prince” who is played by Park Yoochun firstly transforms into Yong Tae Yong based on unknown figure, and now become the real Yong Tae Yong. The fake Yong Tae Yong, under the crisis, once again disguises as real Yong Tae Yong. In episode 15 of “Rooftop Prince” aired on May 9th, 2012, Yong Tae Yong (Park Yoo Chun) is in crisis. Cousin Yong Tae Mu (Lee Tae Sung) who was squeezed out by Yong Tae Yong and hence couldn’t become CEO brings back the real Yong Tae Yong from Chicago, United States of America. Although Yong Tae Yong knew that the real Yong Tae Yong still love, but it’s not made public before the directors’ meeting, so he plans to go into dead end as the last bargaining chip. In the preview video at the end of episode 15, Lee Gak debuts as the real Yong Tae Yong. He leaves the rooftop apartment, even Park Ha (Han Ji Min) whom he loves also doesn’t know about it. Because Yong Tae Yong who is reborn returns to live in the grandmother’s home. Is it 3 drama series? Park Yoochun who plays 3 roles is amazing. This is where the acting of Park Yoochun sparkles. Is Lee Gak plays the fake Yong Tae Yong, or Park Yoochun plays the real Yong Tae Yong, although the name is the same, but it’s the different characters, so in fact, it’s closed to one person has to play 3 roles. But no matter it’s Lee Gak, fake Yong Tae Yong, or real Yong Tae Yong, Park Yoochun accurately interprets them. Park Yoochun who debuted in 2004 as a singer began his first ever acting in 2010’s “Sungkyunkwan Scandal”. Through yearly solid training in 2011’s “Miss Ripley”, he gained rapid development with just 3 dramas, the title of “actor” in front of his name, has come to the extent of not inferior with professional actors. Although there are similarities, but Lee Gak and Yong Tae Yong are two distinct characters. Park Yoochun can differentiate between Lee Gak and Yong Tae Yong through his eyes’ expressions, which are clear even to viewers that the differences existed. The eyes which lost focus of human vegetable is none other than Park Yoochun. Thanks to the short video preview, audience is looking forward to see him playing another Yong Tae Yong. 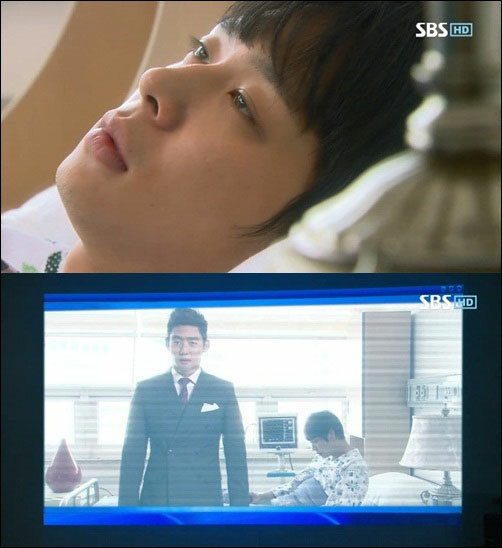 “Actor” Park Yoochun who is far better than viewership ratings. “Rooftop Prince” is competing with KBS2’s “Man From the Equator” and MBC’s “The King 2 Hearts“. Although its viewership ratings do not rank first, but it’s not ranked bottom either. According to AGB Nielson media research, episode 15 of “Rooftop Prince” aired on May 9th, 2012 had the rating of 11.6%, losing to 14.6% of “Man From the Equator”, and having a slight edge to 11.1% of “The King 2 Hearts”. But dramas have been overtaking each others, the ranking is fluctuating, so it’s possible that there may be completely different pattern of ranking at their finale. But to Park Yoochun, “Rooftop Prince” is more important than the ratings. Through the drama, his acting once again won recognition. “Rooftop Prince” has a crucial impacton the future acting of Park Yoochun. In future when talking about “Park Yoochun”, the people who would think of “actor” will be increasing.